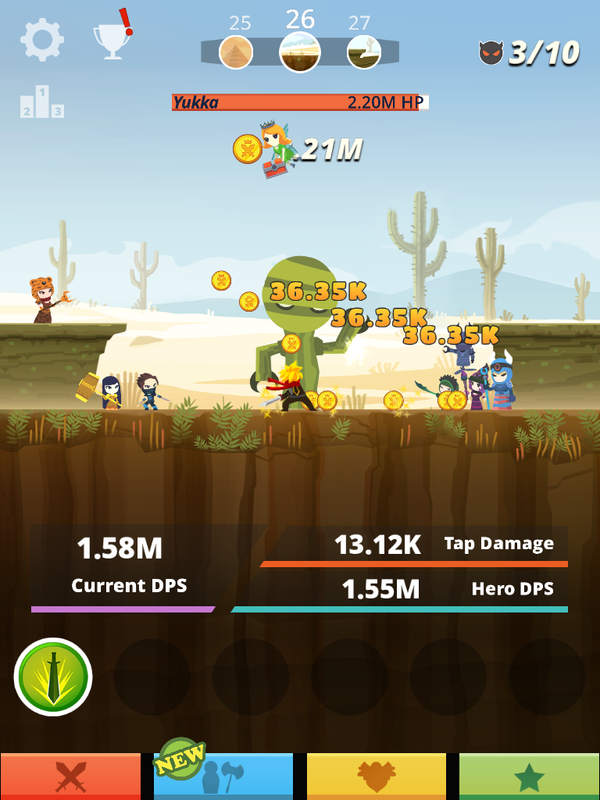 For those of you aching to find out what Cookie Clicker would look like as a fantasy game, I present to you Tap Titans. I’m not the first to notice the similarities between the two games, and I won’t be the last. Nor, for that matter, do I think these are the last games of their kind. With the advent of mobile gaming, it seems that there are certain genres that wish to supplant heroin. The gameplay is simple enough: tap on monsters until they die. These monsters don’t fight back, and aside from the boss levels, none of them have a time limit. Did you fail to kill a boss in time? Don’t worry; just put on Eye of the Tiger and do a 1980’s training montage where you tap your screen in a meat locker, on a beach, in a gym and up the steps of a civic building. 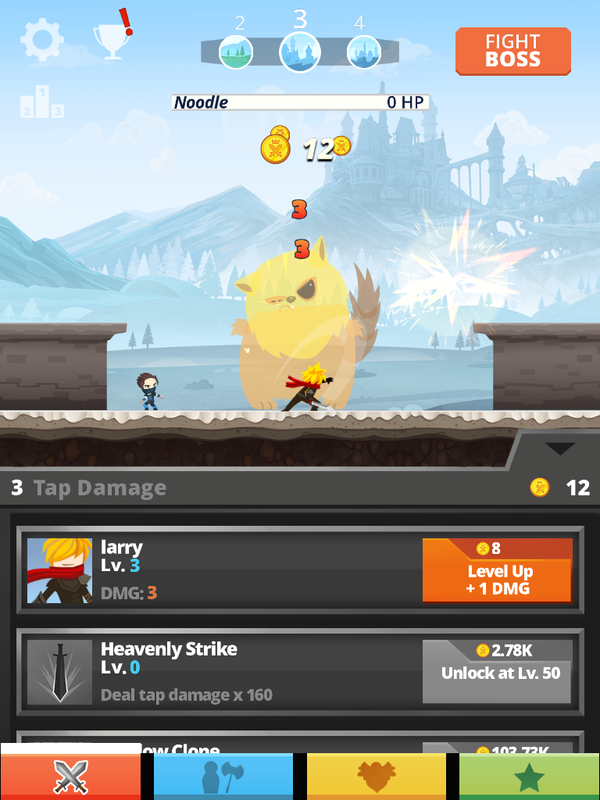 You can level up your character to make his taps even more potent in… tap-iness? You can learn new skills that can make you perform a special tap, or summon a shadow clone to double your tap output, and when you get lazy, you can outsource your tapping to companions-for-hire (who can also be leveled up). When you decide to leave the game alone, your mercenaries will even continue to earn you gold, which can be collected upon your return. Killing monsters in the jungle. On the face of it, Tap Titans may seem ridiculous. I mean, I was a brick wall of indifference when it came to The Simpsons: Tapped Out, so what chance does a game that doesn’t even allow for building your own town have? Actually, Tap Titans, like Cookie Clicker, has managed to combine the right amount of leveling, grinding, and passive gold-earning to make this into a truly addictive experience. This is where the skeletons in the RPG gaming closet come out. Many RPGs, form Final Fantasy to World of Warcraft, and even crawlers like the Diablo series, give you a little bit of that sweet, sweet grind action, but they coat it in enough storyline and poor wardrobe choices to distract you from it. 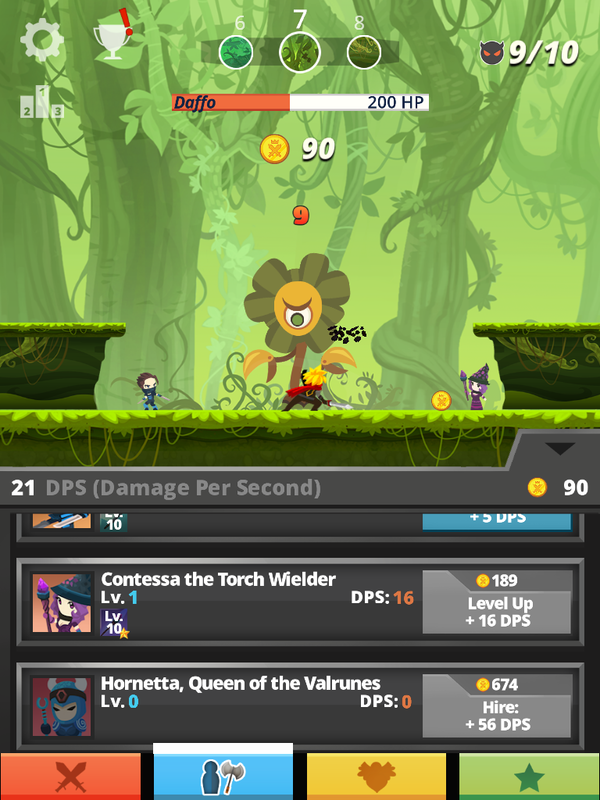 Tap Titans is essentially just the boiled down substance of much of the RPG experience. Killing monsters in the desert. In this regard, I can’t really blame the mobile industry for creating the click/tap-fest genre, but it sure gave the stuff a smooth delivery system. All in all, what you see is what you get. If you wanted Cookie Clicker to dress in J-RPG drag, then here you have it. Enjoy!